I'm sorry what is this? 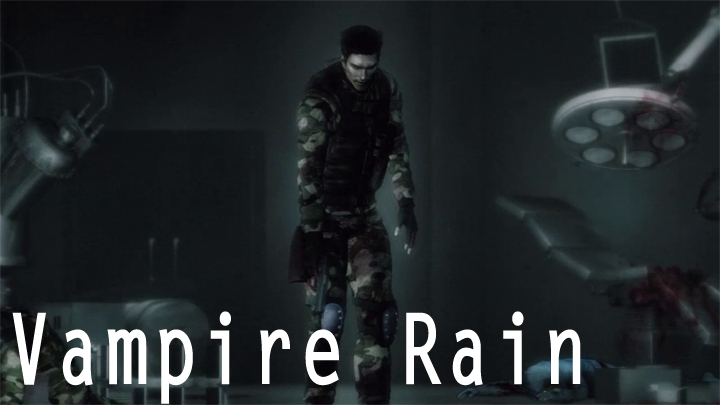 Vampire Rain was a poorly received game (in the USA; Japan loved it) that was released in July of 2007 in the States. It was originally an Xbox 360 exclusive title in Japan, which later got a remake/rerelease on the PS3 with some fixes and added cutscenes. For some reason. We're going to be playing the 360 version for this Let's Play. This will be an uncut LP, considering the fact that this game is very silly and it's cutscenes mean nothing. It's a stealth horror game that has a bunch of stealth and barely any horror. However, there is a lot of rain and a lot of vampires, so you can't accuse the title of lying to you. Joining me on this wonderful adventure is my good friend Lynxwinters, who I'm forcing to suffer through this game with me. I'm playing it so you don't have too. Why not the superior version on PS3? I already own it on the 360 and I really don't want to pay for this game twice. Part 5: Hey Lloyd do you Wanna See a Dead Body!? Part 19: Oh Right. There's a Plot.